Raspberry, coconut and chocolate? You bet! Raspberry Coconut Scones with Chocolate are delicious, This scone recipe incorporates the fresh taste of raspberries with coconut and chocolate. A unique ingredient in this recipe is a chocolaty, raspberry creme candy that is pushed into the top of each scone before baking. After the scones cool slightly, drizzle them with a delicious chocolate glaze for an added layer of yum. As stated above, raspberry coconut scones are not only made with the usual scone recipe ingredients such as flour and oatmeal, they are also made with Greek-style raspberry yogurt, sweeten, flaked coconut, fresh raspberries, mini chocolate chips and chocolate covered Raspberry Cremes Candy A simple chocolate glaze tops these delicious scones. If you can’t find raspberry creme candies, substitute one fresh raspberry per scone. If you’d like to put a different spin on these already delicious scones, switch out the mini chocolate chips with white chocolate chips. Then top these scones with a simple white chocolate glaze. You can then leave out the chocolate covered raspberry cremes altogether. Chocolate covered raspberry cremes might not be available in all areas, so this option might be for you. 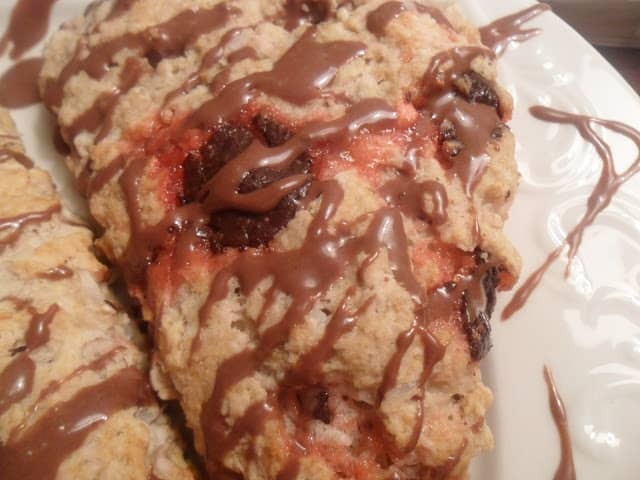 Raspberry, chocolate and coconut collide together in this delicious scone. In large bowl combine flour, oats, sugar, baking powder, baking soda, and salt. Cut in cold, cubed butter with pastry blender until mixture resembles coarse crumbs. In small bowl combine egg, raspberry extract, milk and yogurt. Add egg mixture to flour mixture. Stir until combined. 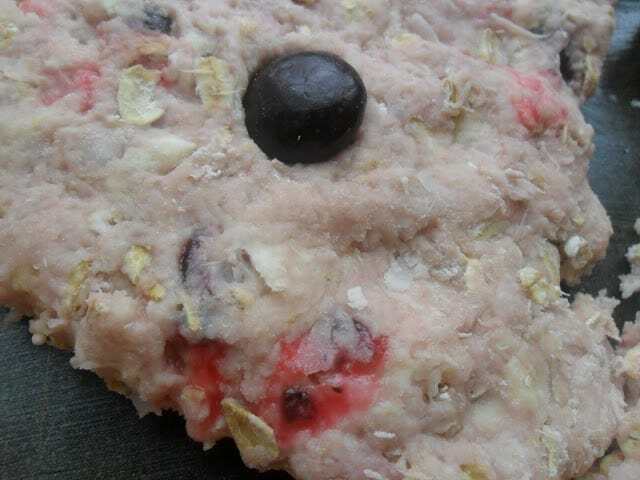 Fold in coconut, fresh raspberries, and mini chocolate chips. Turn dough out onto well floured surface; pat dough into a 10 inch circle. Cut into 8 to 10 wedges. Place wedges on parchment lined baking sheet. 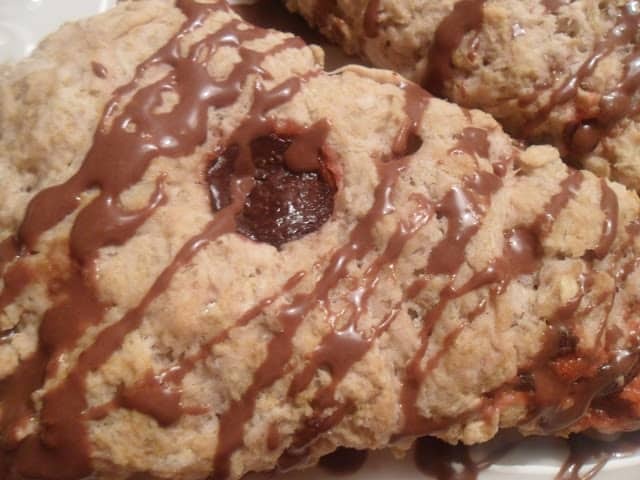 Press one whole chocolate covered raspberry candy into each scone, if using. In microwave melt chocolate chips and shortening on high for 40 seconds, stir until smooth. *Hungry for more Chocolate Recipes? Try these: Rocky Road Fudge, Rocky Road Brownies and Italian Chocolate Cannoli. What a great combination, can't wait to try….Thank you for sharing with the Clever Chicks Blog Hop this week; I hope you’ll join us again! Thanks for bringing these by What'd You Do ThIs Weekend? Your pix are great. I'd like to have one right now!